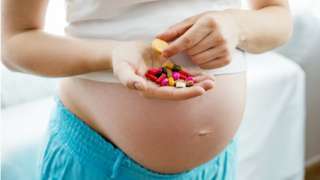 Pregnancy multivitamins are a waste of money because most mothers-to-be do not need them, according to researchers. In Drug and Therapeutics Bulletin, researchers say they looked at all evidence and found supplements did not boost the health of mothers and babies. But pregnant women should make sure they take folic acid and vitamin D, as well as eating a well-balanced diet, as per NHS guidelines, they add. Supplements-makers said some women were not getting enough nutrients. The researchers said folic acid had the strongest evidence to support its use - taking 400 micrograms a day can protect against abnormalities called neural tube defects in the developing baby. Vitamin D - 10 micrograms a day - is recommended for healthy bones in the mother and baby. Some women can get these two pills for free on the Healthy Start scheme. A supplement that can be dangerous in pregnancy is vitamin A. Too much can harm the baby. The researchers said pregnant women might feel coerced into buying expensive multivitamins in order to give their baby the best start in life. But they would do well to resist the marketing claims, which did not seem to translate into better outcomes for mother or baby, they said. "The only supplements recommended for all women during pregnancy are folic acid and vitamin D, which are available at relatively low cost," they said. Janet Fyle, from the Royal College of Midwives, said: "We would encourage women who are pregnant or are thinking of becoming pregnant to have a healthy, varied diet including fresh fruit and vegetables, alongside taking folic acid supplements. "We would also stress that there is no need for pregnant women to 'eat for two'. "This is a myth, and all that is required is a normal balanced amount of food." The Health Food Manufacturers' Association, which represents the food supplements industry, insists that a substantial proportion of women of child-bearing age are not getting enough nutrients from diet alone. The industry-funded Health Supplements Information Service said food supplements could help plug dietary gaps.